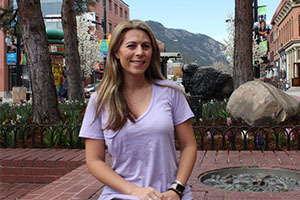 Erica Dahl was practically born into the Boulder retail industry. Her family has owned The Fitter, a mainstay on The Hill, for many years. After traveling the world and pulling inspiration from across the globe, she opened Savvy on Pearl. Erica currently resides in Santa Barbara and is working on a one-of-a-kind t-shirt line, which you can find in her store! Like many Boulder natives and transplants, I have a huge appreciation for good food, the outdoors and any patio that allows me to enjoy both at once! Although not downtown, but a short distnce away, there is nothing I like more than a good patio on a warm, sunny day in Boulder. Start your "patio day" with breakfast at Chautauqua Dining Hall. Not only do they have a great outdoor seating area, but they are located right at the base of the famous Boulder Flatirons. Plus, this breakfast spot is in close proximity to the Chautauqua hiking trail which is a huge bonus. After you have worked off your breakfast with a little trail hike, head to the Pearl Street Mall for some shopping and entertainment. Make sure you cover the West End, "The Bricks", and the East End - all full of unique stores, many of them locally owned. Once you have shopped until you drop, head to the Rio Grande for some Mexican food and a refreshing (and strong) margarita while enjoying one of the best views in downtown Boulder. Make sure you sit upstairs on the patio so you can see the epic view of the mountains. After you rest up from your busy morning, head to the outdoor patio at Bitter Bar to catch the last rays of sunshine as well as an artisan cocktail (or two). After that, finish the evening at Hapa on their patio located in the heart of the Pearl Street Mall for some amazing sushi and even better people watching. For a sweet treat, head to the patio at Leaf Vegetarian Restaurant for their amazing dessert offerings. (The vegan carrot cake will make you question the world "vegan" as it is amazingly delicious). It's a no brainier! Why would you be anywhere else? The Rio Grande Mexican Restaurant is famous for its flavorful grilled specialties and award-winning margaritas. Loungey hipster hot spot known for its creative drink menu, small plates & weekly live music. Boulder's only full-service vegetarian restaurant serving lunch and dinner daily, weekend brunch and great happy hour specials. Full bar, organic wine list, fresh juices, extensive tea menu.